I've been on a quest to find what, for me, is a perfect Belgian Tripel recipe. I'd like something that's a cross between Tripel Karmeliet and Unibroue's La Fin Du Monde. It should be slightly sweet, not too bitter, have a nice head on it, and have the typical spicy/fruity notes that true Belgian Tripels are noted for. I've brewed a few extract-based tripels that weren't bad but weren't close to what I wanted. I've also brewed two or three all-grain tripels. One of those either soured a bit in the kettle due to a stuck mash or I added too much coriander to it - I don't know. The bottom line is that I'm still chasing that Holy Grail of a tripel recipe I love. The good folks at CandiSyrup.com post clone recipes of popular Belgian beers which of course use their products for the adjunct components. 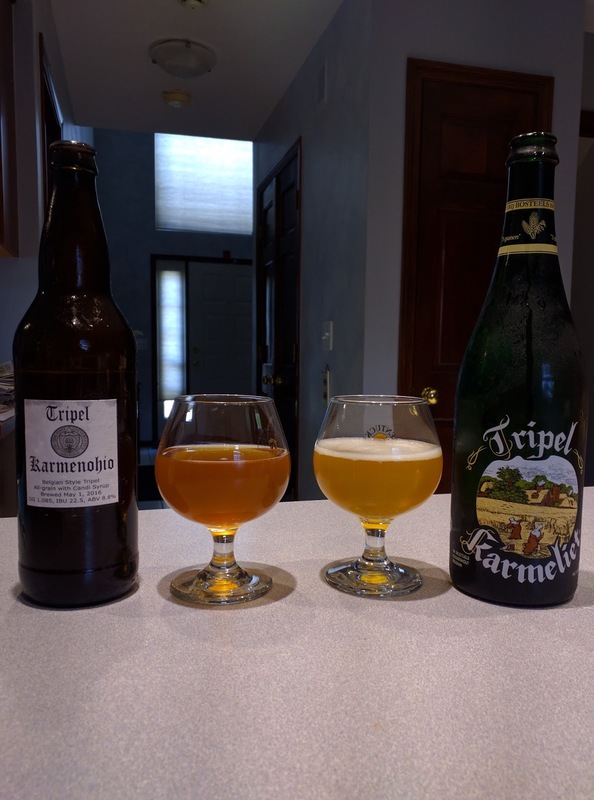 They have a recipe online for a Tripel Karmeliet clone. I had intended to brew their recipe as-is but couldn't source all the ingredients locally. When I finally thought I had everything and my yeast was close to expiration, I started out to brew it but found that once again I didn't have quite everything I needed. What's below is the recipe as I made it, which has much in common with the CandiSyrup recipe but is definitely NOT that recipe. Heated 5.8 gallons of water to 122F and added the grains and rice hulls. Mashed at 122F for 45 minutes. Increased temperature to 147F and mashed for 60 minutes. Heated two gallons of sparge water to 170F. Mashed grain at 162F for 20 minutes. Mashed out at 170F for 10 minutes. Sparged with the two gallons of 170F water. Volume at this point was just under 6 gallons. After this, the wort is pumped through the chiller into the fermenter. Target temperature is 64F. Once in the fermenter, pure oxygen was added for 60 seconds. The vial of yeast was then pitched into the fermenter, and it was sealed. Ferment until final gravity of 1.013 is reached, then transfer to a secondary fermenter and chill to 50F for four weeks. This should be approximately the first week in June in my case. At 1.012 gravity, prine with 34 grams per gallon of clear candi syrup and CBC-1 yeast (rehydrated). Bottle condition two weeks, then cellar three months. Owing to a family trip in May where I wouldn't be able to babysit the beer during the secondary fermentation, I chose to bottle it a couple of weeks early. The beer has now been in the bottles since approximately May 18, 2016. Giving it the full conditioning and cellaring time specified in the base recipe, it won't be ready to drink until mid-August. When I finished bottling this beer, I had about eight ounces left over. I poured those into a glass and put it in the refrigerator to chill for a bit. What I discovered was pretty impressive. Even flat and slightly warm, the beer was pretty darned good. It was slightly sweet but nowhere near cloying. I picked up orange, orange zest, orange peel, a hint of plum, and tropical fruit note to it in its "green" state. It was definitely one of the better beers I've made. I'd say that already my version has the sweet malt, the citrus and citrus zest, a hint of vanilla, and possibly some of the honey or peach. I'm looking forward to comparing it to a bottle of the real Tripel Karmeliet when it's finished conditioning. (July 1, 2016) At left, you see the beer described above to the left of a glass of actual Tripel Karmeliet. Although it doesn't show in the photo since mine was poured first and it took a moment to set up the shot, mine actually did carbonate and have a small head on it. The color of mine was a bit darker than the real beer, so that's something to adjust next time around. The aroma of the real Karmeliet is a little more fruity than mine. Mine has a touch of caramel to it that the real Karmeliet doesn't have. Mouthfeel of the real Karmeliet is thinner and lighter than mine, with a lot more carbonation. The flavor of the real Karmeliet has a slight lemony flavor to that I suspect could come from coriander. The real Karmliet is also a touch more dry than mine, though as noted earlier I prefer my tripels a little on the sweet side. All things considered, this is the best tripel I've made to date. Despite being darker and lacking the champagne-like carbonation it should have, this version has a great flavor, nice aroma, and pleasing mouth feel. Wheat Malt: When I brewed this, I thought I had wheat malt on hand but didn't, so I used the wheat DME that I had. When I brew it the next time, I'll make sure I have actual wheat malt. This might lighten the mouth feel and color since my DME was a bit older. Mash Changes: Although I am happy with this tripel being a little sweet, I might dial it back a notch. Next time, I'll plan to increase the length of the first Saccharification rest at 147F to 90 minutes and increase the second rest at 162F to 30 minutes. This should dry the beer out a little bit and may help it ferment out a bit more. Candi Syrup: The original recipe from Candi Syrup, Inc., calls for Blanc Soft Candi Sugar rather than the Simplicity and Golden syrups. The Golden syrup might have darkened the beer, so I'm thinking I'll do two containers of Simplicity next time. Yeast: The sweet mead yeast worked really well in this beer, giving it a nice orange flavor. The beer lacked the usual Belgian fruity notes, though, so I'm disappointed with that part. Next time around, I'll plan to pitch the sweet mead yeast and probably a packet of a dry Belgian yeast. I'll also plan to raise the fermentation temperatures up to push the yeast to generate more flavor next time. Coriander: Since the real beer does have a lemony note to it, I'm going to add a very small amount of crushed coriander in the next one. This should provide a hint of lemony citrus flavor that gets it closer to the original. Bottling: I'm still managing to generate a lot less carbonation than I want. For the next iteration, I'm planning to use clear candi syrup to prime it, bottle conditioning yeast to ensure there's viable yeast in the bottles, and keep them in a 76F environment throughout conditioning to give the beer the best chance of full carbonation. With these changes, I think I'll be well on my way to an excellent tripel... though I'd say this one as-is is very good.